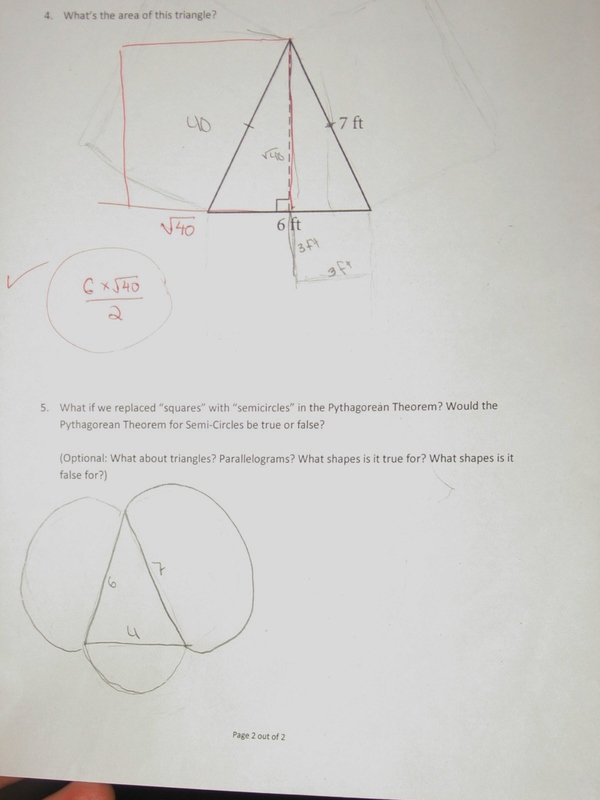 Posted in Feedback, Geometry, Naming Coordinates, Transformations, Uncategorized. Take a moment before reading on. How many squares would be in the 7th step of this pattern? In the 43rd? In the nth? Take another moment: what mistakes would you expect to see? 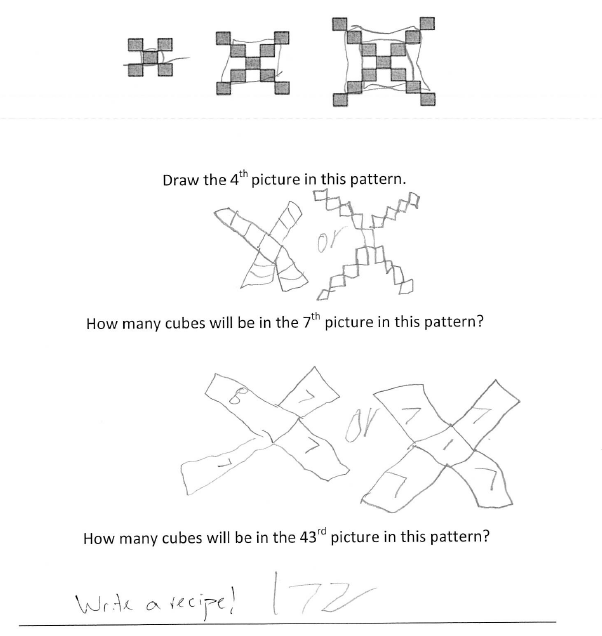 From looking closely at student work with other visual pattern problems, you’d expect kids to think about the change of this pattern in two different ways. Thinking about the pattern change recursively – Students would think about the pattern as adding four squares on to the previous image at the corners. The relational goggles are more powerful and useful. 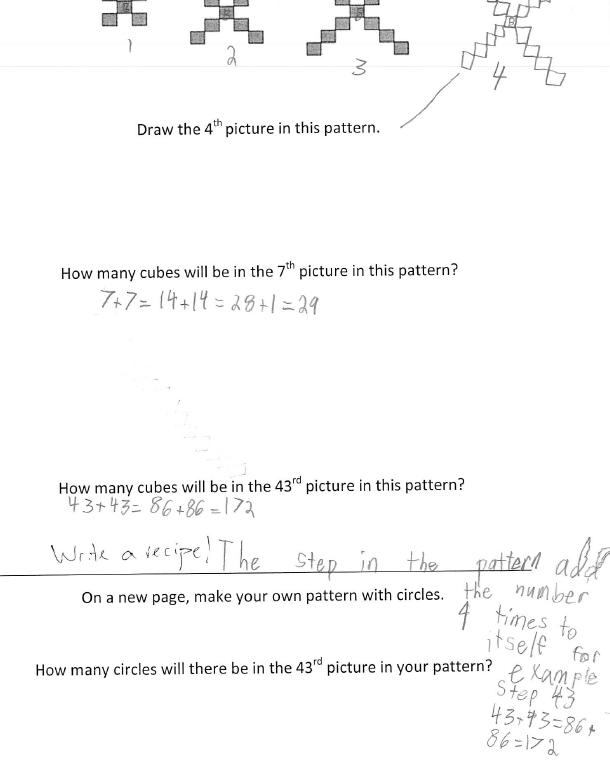 It helps us calculate any step of the pattern efficiently. It can be generalized to linear functions. 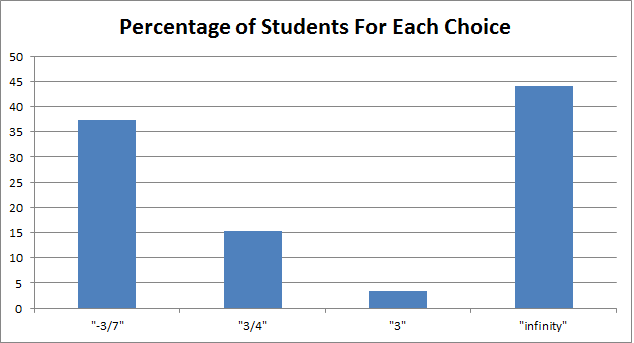 Further, most students have an easy time seeing this pattern’s recursive growth. The real learning that can happen with this pattern, for most students, happens in the move from a recursive to a relational perspective. 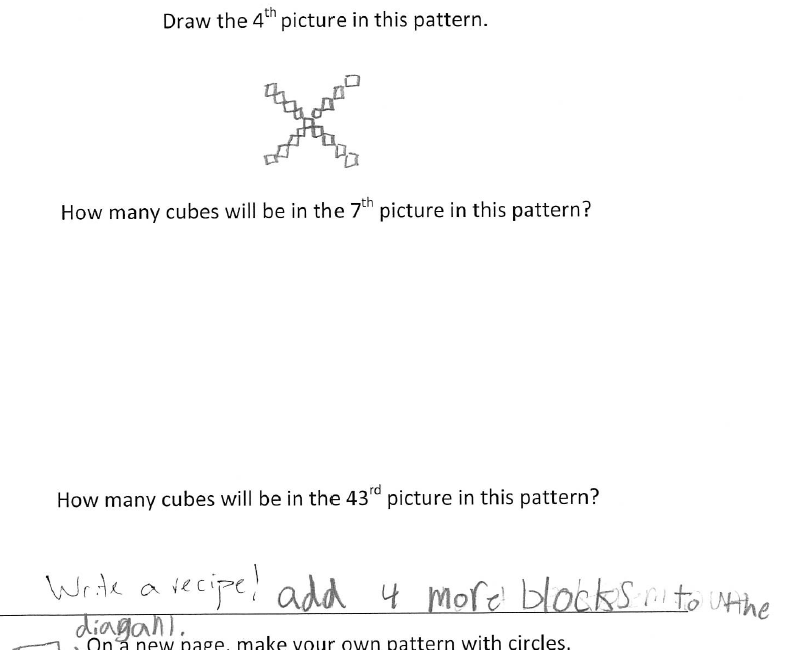 With that in mind, I want to share some mistakes that my students made on this pattern. I’ve organized the mistakes into two categories, and I’m curious if you’ll see them the way I do. The way I see it, all the mistakes that I placed in Category 1 show strong evidence of seeing the pattern’s change relationally. Both of the students in Category 2 show a recursive perspective. In fact, the students in Category 2 don’t even make any mistakes! What feedback do you think the students in Category 1 should get? What about the students in Category 2? If all you care about is whether a student’s answer is right or wrong, then all the students in Category 1 will get some sort of nudge towards the right answer, while the students in Category 2 will be praised for their correct answers and maybe encouraged to keep on going. On the other hand, the second group of students are getting right answers using a limited perspective. Ultimately, we’d like to help them see a relational perspective. Even though they have the right answers, they’re struggling here. It’s not news that kids who get the wrong answer might be thinking in more sophisticated ways than students who got some question correct. What is news, I think, is that we ought to be as explicit as possible to ourselves about how those students are thinking with more sophistication. That’s the sort of thinking that can help us be strategic about the sort of feedback that we can give. What feedback should Category 1 get? I’m inclined to use a very light touch with these students. They’re working within a powerful framework — they’ll likely be able to tease out where they went wrong. Even though they are using a strong perspective to analyze the problem, I still think it’s worthwhile to ask them to correct the calculations. 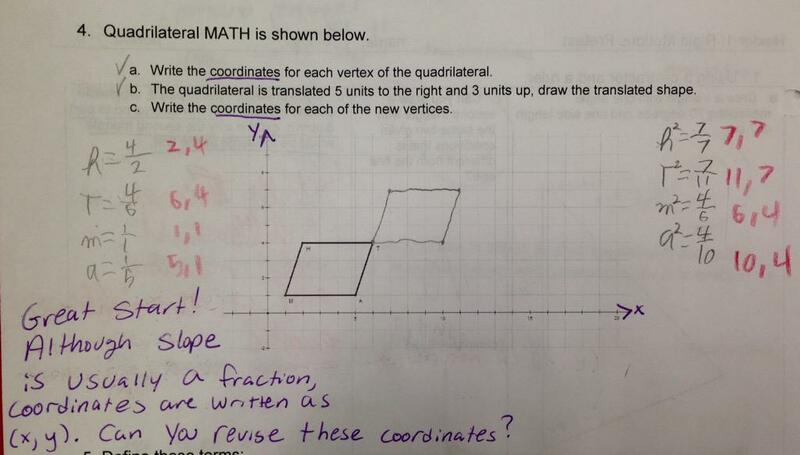 First, because even though getting a correct answer isn’t all that matters, it also matters to students and to me. I want to show that I value correctness. 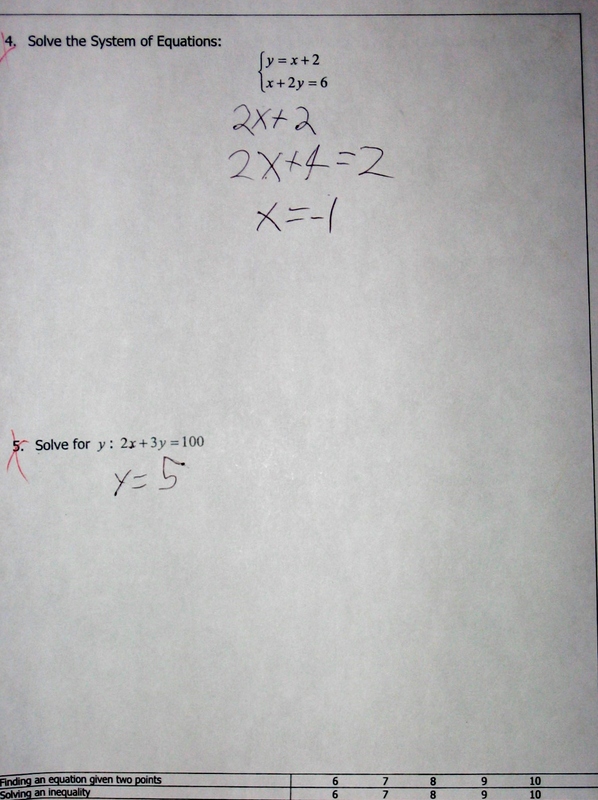 Second, because seeing what doesn’t need to change in their answer is ultimately good for learning. I see this as a chance to adopt that relational view on the pattern again (“Oh wait how did I do this…Oh yeah!”). I love the way you brought the step number into your calculation. Can you revisit this? Something’s wrong, but I’m not sure what. Your rule here is excellent. 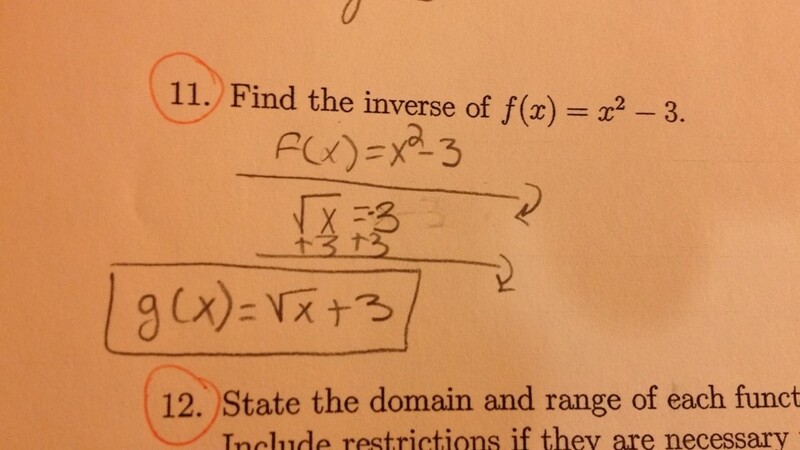 Can you check these answers again? Some teachers will be tempted to encourage Category 2 students to continue their work, even if it’s within a recursive perspective. They might agree that the goal is ultimately for these students to adopt a relational perspective, but they’re willing to bet that kids will come to a “realization” while working recursively all on their own. Or, teachers want to affirm these students’ good thinking, so they are reluctant to offer them another way of thinking. They’re willing to defer the relational view to some other time, and maybe the kid will just pick up the relational view during a class discussion or by talking with a classmate. Those are all legitimate moves, depending on the kid and the classroom and the course. But what if it’s important — for the kid, classroom, course — to help these students move from a recursive to a relational perspective? What feedback could they get then? Lovely work so far. Can you see where the step number appears in each diagram, and use that to find the 43rd step? I see the 4th diagram as made up of 3s. Can you see it as made up of 4s? Try to use that to find the 43rd step. Nice job noticing the growth pattern. 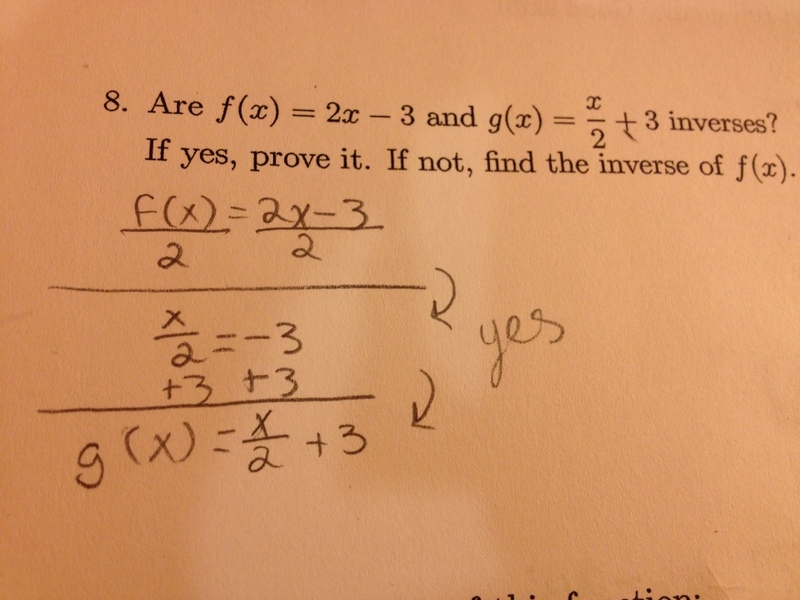 Can you find a solution to the 43rd step that doesn’t involve adding 2 forty-three times? Can you show that there’s a counter-example to the “multiply the step number by 4” rule? I’ve squawked a bunch about feedback. I’ve likewise done my share of squawking about student mistakes. I’m realizing now just how much that squawking has been missing out on by failing to get specific about student thinking. This isn’t the familiar complaint (familiar to me, at least) that by focusing on mistakes we only see students for their errors. Or maybe this is that “deficit model” complaint, but I had always interpreted as saying something about what we value in our students, and now I’m seeing how only thinking about mistakes really gives you nothing to latch the errors on to. It’s really limiting. The flipside of this realization is that to really get at mistakes, feedback, hints or next instructional steps, we need to map out the terrain of student thinking. 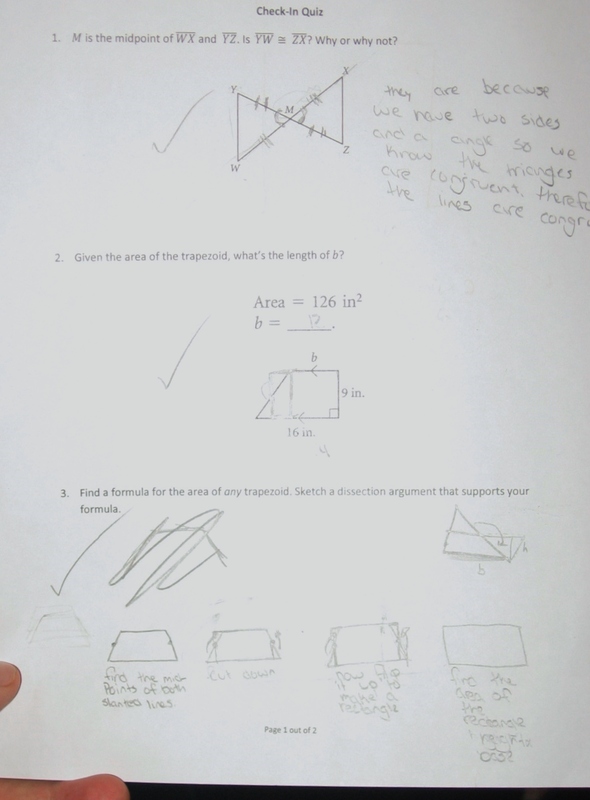 And there’s no way to do that without looking at sets of student work, rather than some single kid’s thinking. 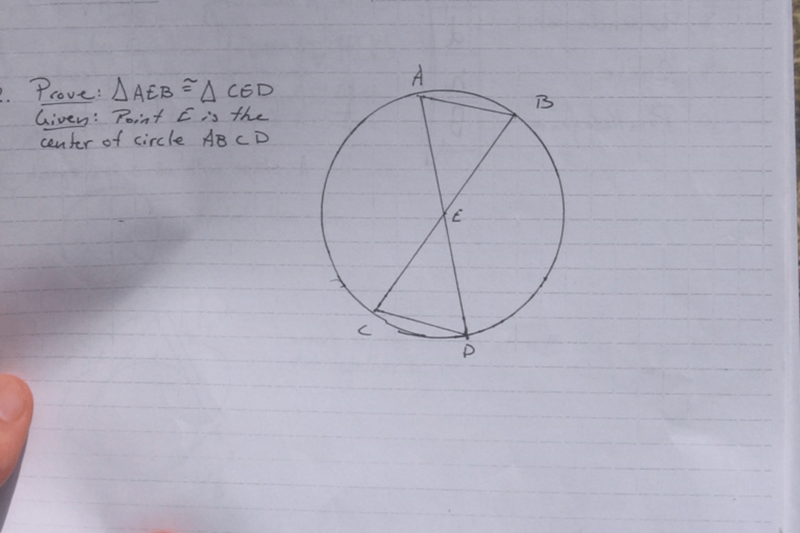 And there’s no way to do that without getting messy with the details of particular mathematical topics. This is as true in my teaching as it is for my work here or anywhere else. My best feedback comes when it’s purposefully guided by some sort of explicit story about how student thinking develops for this type of problem. 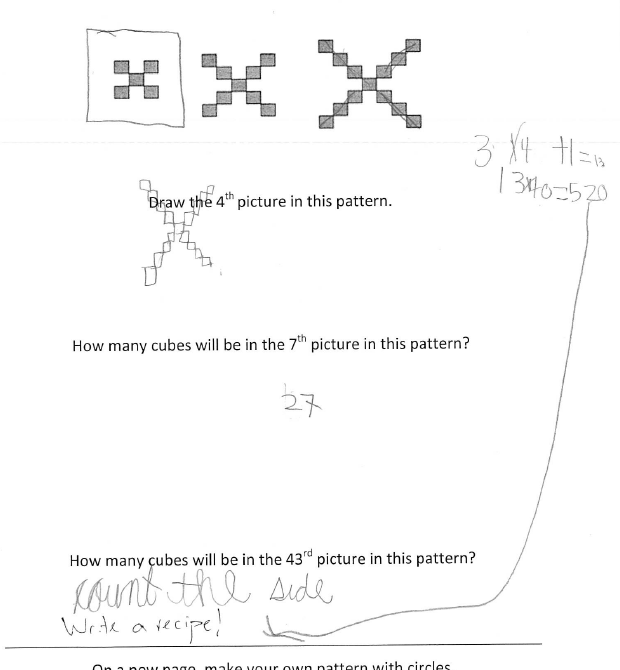 This is probably something I first really learned how to do with multiplication in 4th Grade, and it’s heavily influenced by the way I read the work of the Cognitively Guided Instruction team. Next post: more on why class sets are the best. 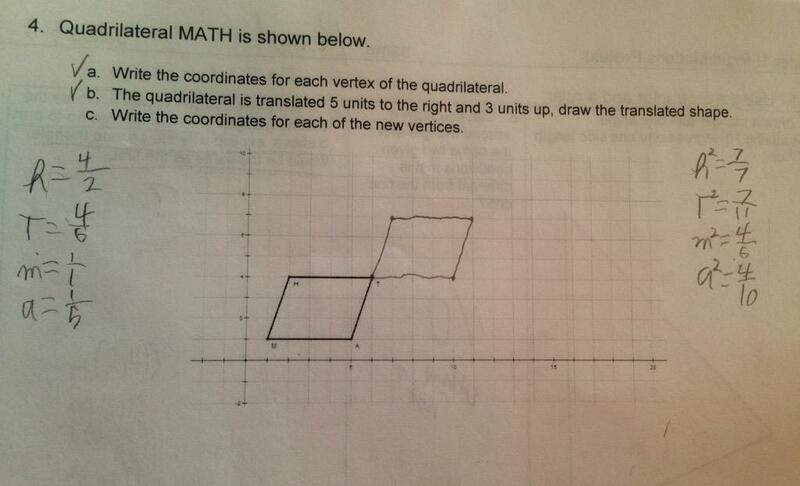 Posted in Creating Equations*, Feedback, linear functions, Operations & Algebraic Thinking, Patterns, Visual Patterns. How do you predict that a group of students (9th Graders, Geometry, nearly all are comfortable with scaling) would respond to this prompt? Do you think they’ll disagree? Converge on one option? What reasons do you think they will bring to support their answers? Do you think that their responses will differ significantly from the responses that a group of teachers would give? If so, how? What do you predict students will respond? How do you predict that a group of teachers will respond? 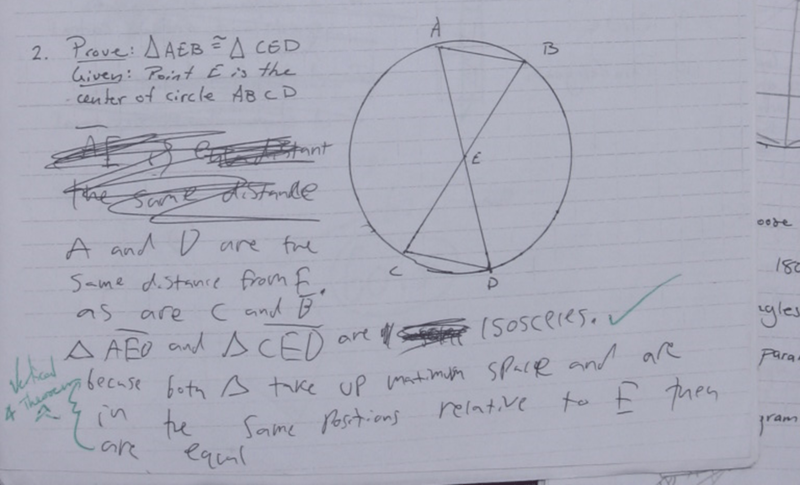 Posted in Experiments, Feedback, Similar Figures, Similarity, Right Triangles and Trigonometry. 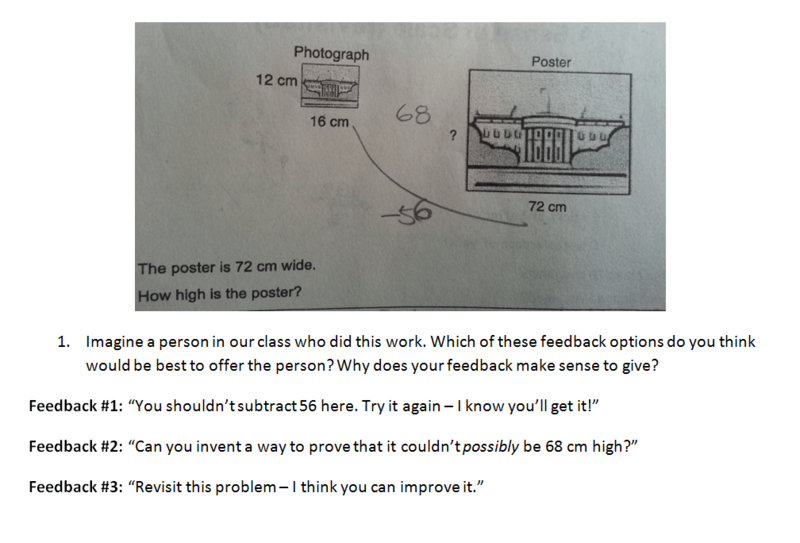 In a lot of ways, it’s much easier for me to come up with helpful feedback to give on rich, juicy problems (see here) than it is for your typical quiz or test. 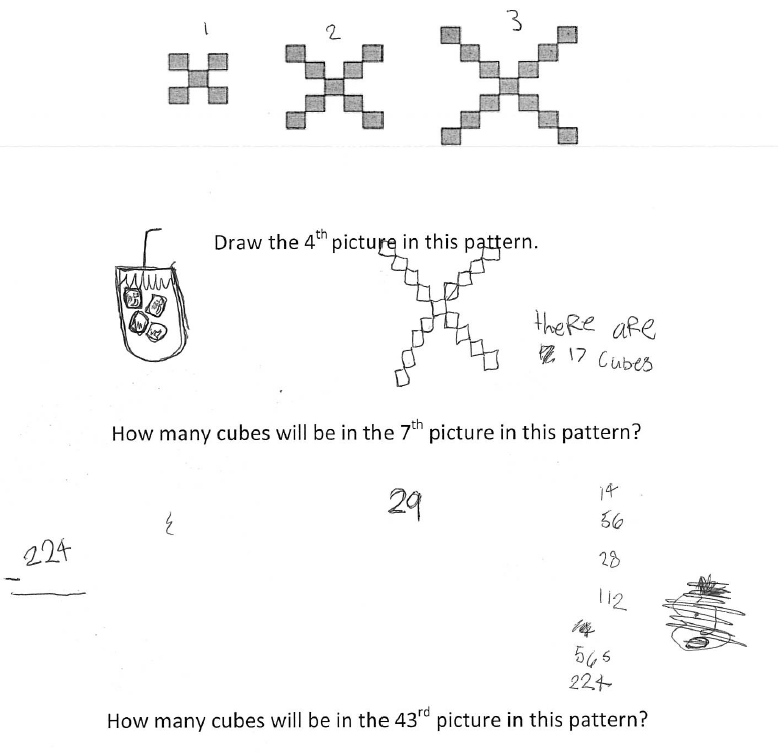 I find it much harder to think about how to give feedback that helps a kid’s learning when (a) the quiz is full of non-open questions and (b) the kid’s solutions don’t show a lot of thinking. But a lot of classroom assessments end up like that, and it’s important to figure out how to deal with those tough situations effectively. So: What would you write as feedback on this quiz? Assume that we’re dealing with written feedback here. Not a conversation. You might decide to give feedback on every question of this quiz, you might not. 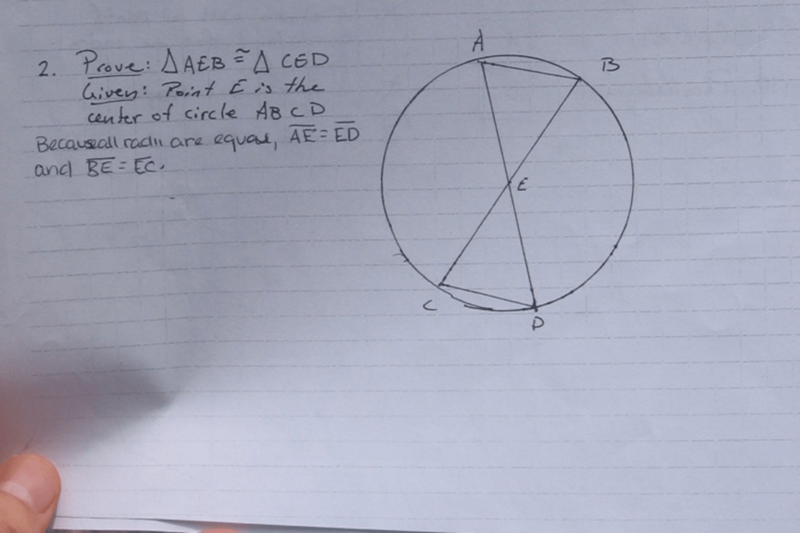 Would you choose to mark the questions as right/wrong? Would you try to find something to value about this kid’s work in your comments, or will you be all hardass instead? Would you ask questions or give suggestions? Would you write one, several, or many comments? Would you reject the constraints in some way? Would you ask the kid to explain himself? Excited to read your thoughts! 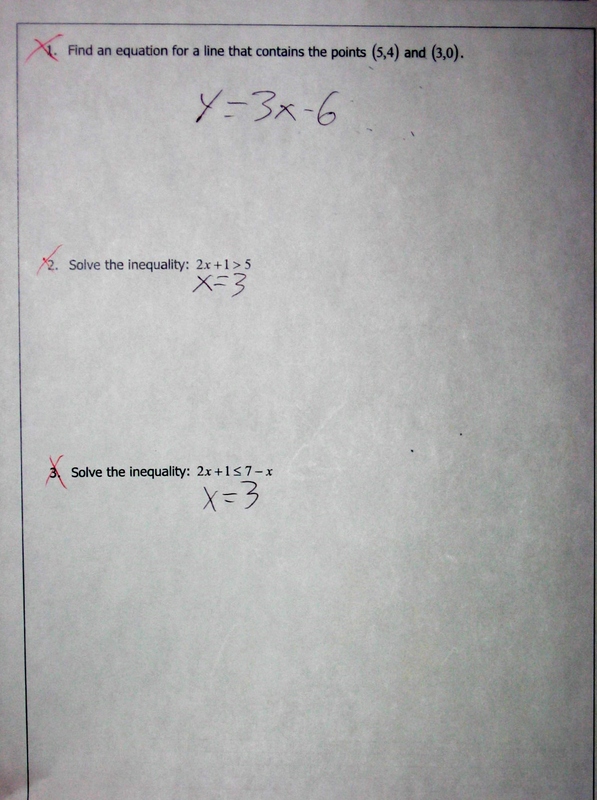 Posted in Creating Equations*, Feedback, linear functions, Reasoning with Equations and Inequalities, Solving Linear Inequalities, Systems of Equations. How do you help kids monitor themselves in this way? Do you monitor yourself in this way when you’re doing math? Posted in Feedback, Rates, Ratios & Proportional Relationships.